That is a nice stove, I haven't seen one like it. We don't actually have a wood stove I guess, it is more of a furnace that I put in the cellar with duct work attached. Since it is in the cellar, all the mess is kept down there on a concrete floor. 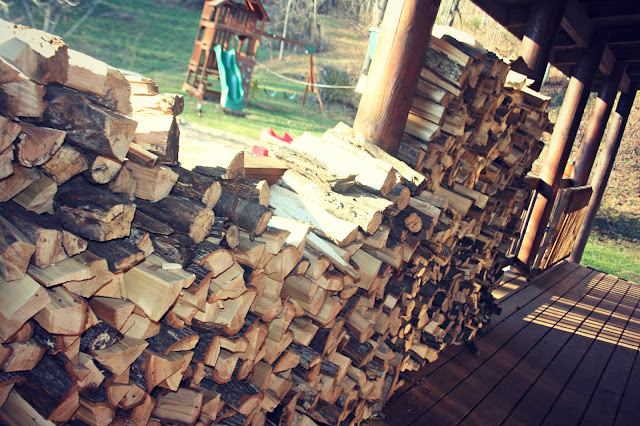 I cut wood at the end of winter so it is ready for the next season. It is hard to burn green wood unless you already have a hot fire to put it in. I like the smell especially if I am burning some cherry. Had enough rain yet? Yours is really big and tall. Is that a cooking burner on the top? Wood stoves are GOOD! No others seem safe to me. A friend's son's house just burned down and he lost everything, including his cat. Due to an electric space heater. My earliest memories are of my grandma cooking with a wood oven and multiple wood stoves over the big family farmhouse. The house always smelled of smoke and the food smelled of smoke. It was too much. Now I actually despise the smell of wood-smoke. I guess it was too much of a good thing. That stove is so pretty! We have a pellet stove which works great, but it isn't the same as wood heat. And I have to clean it out every other day...blechh. That is a very pretty stove! We had a plain pot-bellied stove when I was growing up. I would sit by it to read or do homework. Such a comforting heat! They are messy, I have mine outdoors. I get free kindling from a local high school shop class. What a lovely little wood stove. It seems much smaller (narrower) than the one's I remember from my days in the pacific northwest. Once I lived with a wood stove. HATED it. Never again, thank God! Oh but I bet they are so cozy! I remember that mess from the wood and kindling sticks and the ashes when cleaning the darn thing but I'd love one now :-) not cold enough here but still..I love the look of the wood stacked along the veranda, looks cozy. Have a wonderful Christmas. Oooohhh, the mess would drive me insane, but better to be warm, I guess. It's a trade-off. We have the fake wood fireplace that looks pretty all the time; however, I don't think it's as warm as yours probably is. We put our wood stove on a big rock base, and voila, much less mess. Or at least mess that you can see. HOpe that you have a wonderful Christmas and know your boys are excited. Enjoy the warmth and coziness of that fire! 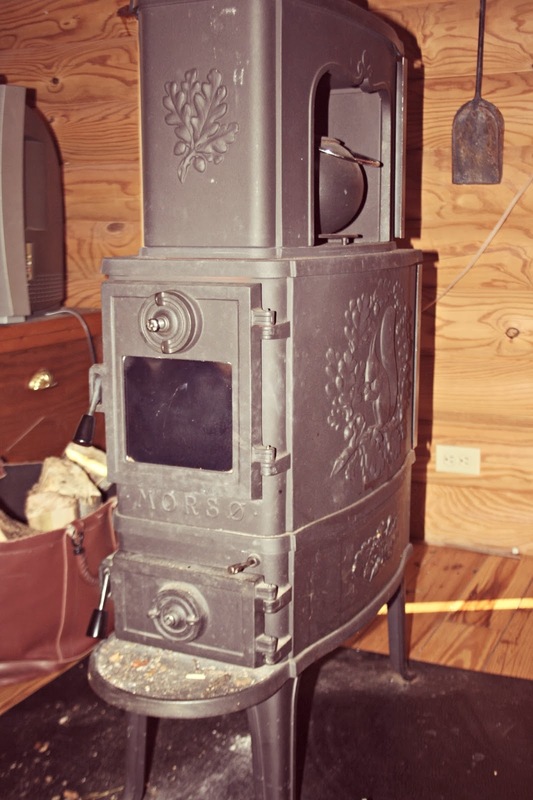 That's quite the wood stove you have there! I don't enjoy the mess either but the toasty, warm, free heat it puts out makes it worth it for sure! Yes, focus on the positive! I'd love to have a woodstove. I especially like that it works even without electricity. Would be great since our power goes out quite a bit in the country. But I am ready for spring as well! I have a couple friends that have these and the think that they are pretty awesome too. LOL.. I hear ya. We have one of the fireplaces going on most cold nights, and yep, it makes a mess. we love wood stoves and wish we had one! Nothing like wood heat. Nothing. Your wood stove looks great. I can remember as a teenager having to add wood to our stove in the morning to get the chill out of the kitchen. We used it back then to cut heating costs. Oh yes, I forgot to wish you a very Merry Christmas. Stay safe and warm. We have a small one and I'm comforted knowing it's there in case the power goes out. What a pretty and functional stove. Really like the upper part where a kettle can be kept warm. I put wood on the back porch a couple of months ago so it's nice and dry. It's been curing for a while so just needed to keep it dry. Always seems like a nice thing to have, if you're not the one cleaning up or chopping the wood. I love that stove. There's nothing like the warm heat wood gives off. LOL! The mess would drive me batty....but think of all the $$ you are saving.